Reusable pads work in as little as 20 minutes! Beautifully reducing the look of wrinkles and expression lines, these unique SilcSkin facial pads help smooth and relax skin while you sleep—or in as little as 20 minutes, any time! Developed by award winning Hollywood makeup artist Camille Calvet, the soft, these facial pads are 100% medical grade silicone, made without additives, fillers, adhesives or allergy causing latex. When worn overnight, this brow set relaxes and retrains facial muscles, softening fine lines and wrinkles while preventing new ones from forming. 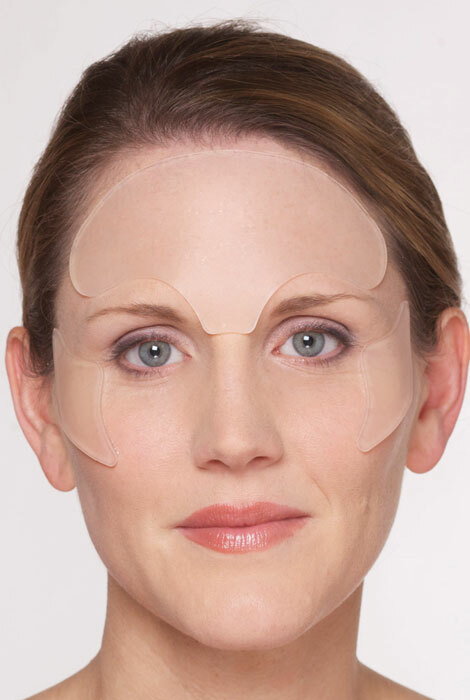 Specially shaped for wrinkle-prone areas on forehead and between eyebrows, each reusable pad works 30-60 days, depending on usage and skin conditions. Pads retain their adhesive quality, even when washed. Set includes 1 brow and 2 multi-area pads. It is comfortable to wear all night and stays on! I use the eye pads, though I cut them in half, every night. I am a side sleeper and toss and turn side to side. I end up with a big wrinkle on my brow that was beginning to become permanent. It is now gone and these keep it at bay. They are very thin and clear, so my husband had never noticed I was using them until the dog got a hold of one and I had to fess up! Be sure and follow directions, no moisturizer and I rinse them and let them dry sticky side up every few days. I also use the décolleté one before I go out at night. It works wonders, too. Lost one star for price. Forehead and patches work very well and no problem sleeping with it. I've tried the decollete pad so if these work as good as that, I'll be happy. To stop wrinkles in-between my eyes mostly. if the wrinkle decollete pad works then these probably will to. So I'm going to give them a try. I love them, they really reduce the wrinkles. I used the chest pad and loved it!!!!!!!! I've been using this at night on my down lines. I like that they are reusable. In the morning my lines are so much smoother. I haven't used the large one yet, just the small triangle right between my brows. hoped for a better look. To help with those 11 lines between the eyes. 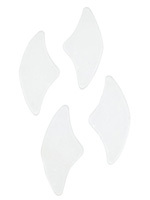 Because the decollette pad works for me, I wanted to get them for other areas too. I use products that seem to be helping in decreasing my deep brow area wrinkles. However, while I can keep myself from frowning during the day, I can't control it during sleep. This of-course is a setback. These types of products help you control and train your face muscles. But I didn't like the tackiness of the other pads I tried. These may be more comfy. So I can sleep on my side. These work. Helps w/ the forehead wrinkles while sleeping or use for an hour before applying make up. I have vertical lines between my eyebrows and wanted to see if these helped. Wanted to find a product that would work on forehead wrinkles. I have used the decolette pad for a long time-I wont say it works 100%, but it does help with the wrinkles. The face pads are made of the same material, hoping they will do the same-this is first time using these. I have used them to stop sleep wrinkles, and they work well. I know first hand they really work! hoping something actually works to relieve deep lines on forehead. I love these. I actually used them to keep the pillow from making "pillow wrinkles", as I am a side sleeper. I don't use the full brow and cut it to fit the 11's between my brow. I cut the rest of the pad yo use elsewhere. 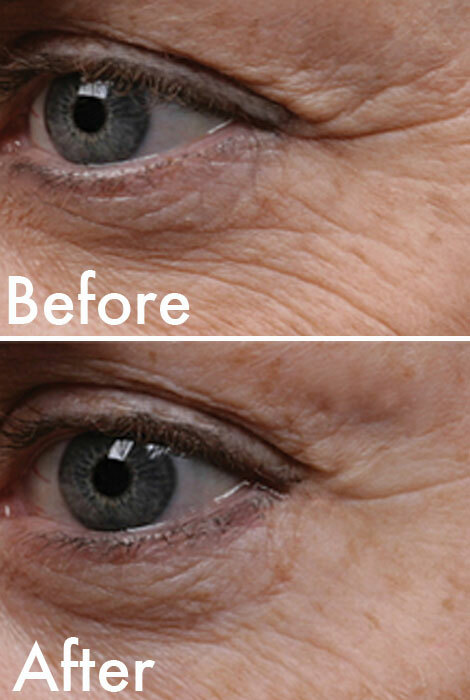 Wear for an hour and wrinkles are gone! I use the dÃ©colletÃ© pad, too, before going out with a v-neck. first time purchase. I hope I love these as much as the dÃ©colletage pad! I'll comment soon. Recommended by my sister in law, Cyd Runsvold! I have been using Frownies, this looks similar without having to purchase the product over and over every month! is there one specifically designed for the area around the eyes like for crow's feet and saggy upper lids? BEST ANSWER: I used them on the forehead and under lower lip and they worked! I would imagine upper lid would be difficult!